As Monterey’s first U.S. Green Building Council LEED® Certified hotel, the Portola Hotel is honored to be recognized for our commitment to sustainability and the environment. To learn more about Portola Hotel & Spa’s green initiatives click here. Portola Hotel & Spa prides itself on delivering an exceptional experience with Four Diamond service. We are honored to have been recognized by guests, industry insiders and leading travel and hospitality outlets. Below are some of our most recent awards and accolades. Peter B's Brewpub, Monterey's original craft brewery was recognized by Monterey County Weekly readers for the Best Wings in 2019. Jacks Monterey was recognized for the Best Martini in the Monterey County by Monterey County Weekly readers. Spa on the Plaza was voted Best Spa for Skin Care in the Monterey County by Monterey County Weekly readers. Conde Nast Traveler's Annual Readers’ Choice Awards "Hotels & Resorts"
Portola Hotel & Spa has just been chosen as a winner of Condé Nast Traveler's prestigious 2018 Readers' Choice Awards. Out of hundreds of qualified properties, the Portola Hotel & Spa takes its place among the Top Twenty Hotels in Northern California as #11 on the list. Peter B’s Brewpub at Portola Hotel & Spa was awarded a Bronze Medal at the Great American Beer Festival 2018 for Tropic Maelstrom in the American-Style Fruit Beer Category. Portola Hotel & Spa was recognized for the 2018 Accommodations and Visitors Services Award at the 32nd Annual Business Excellence Awards. Peter B's Brewpub was awarded a gold medal for the Dry Irish Stout at the California State Craft Beer Competition. Portola Hotel & Spa was named as one of 2017 Smart Stars Award Winners for Best Eco/Green Hotel. The AAA Four Diamond Portola Hotel & Spa was recognized as the only U.S. Green Building Council LEED® Certified hotel on California’s Central Coast. Peter B's Brewpub was recognized as the best American-Belgo-Style Ale amongst competitors for the Great White Buffalo Belgian. Jacks Monterey was recognized for Best Martini, and Peter B’s Brewpub was also recognized for Best Bar for Baby Boomers. Peter B’s Brewpub was recognized by Monterey County Herald readers as Best Sports Bar / Restaurant. Portola Hotel & Spa has just been chosen as a winner of Condé Nast Traveler's prestigious 2017 Readers' Choice Awards. Out of hundreds of qualified properties, the Portola Hotel & Spa takes its place among the Top Twenty Hotels in Northern California. Portola Hotel & Spa was recognized by the Silicon Valley Business Journal in their list of the top 50 hotels in Silicon Valley. Portola Hotel & Spa was recognized by Monterey County Weekly as Monterey's first (and only) U.S. Green Building Council LEED® Certified hotel. Peter B’s Brewpub was also recognized for Best Happy Hour. Jacks Monterey, the new restaurant located inside Portola Hotel & Spa’s tree lined atrium lobby, has been awarded the Wine Spectator’s 2017 Award of Excellence for its wine program. The Award of Excellence is Wine Spectator Restaurant Awards’ top honor, in which a restaurant offers at least 90 selections, featuring a well-chosen assortment of quality producers along with a thematic match to the menu in both price and style. 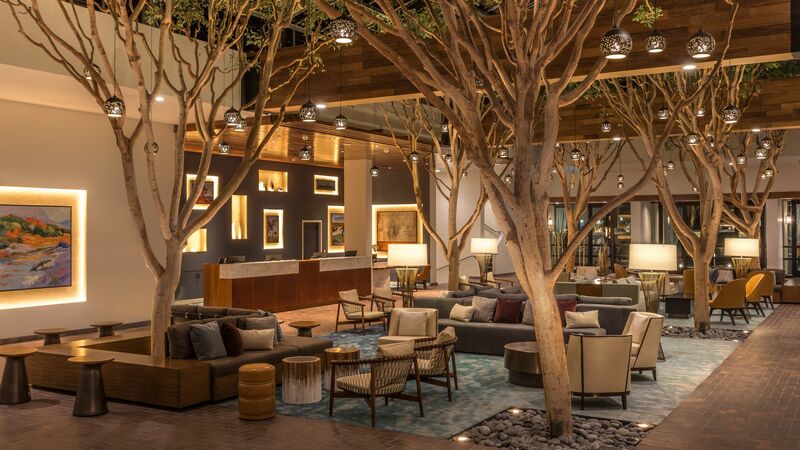 California Lodging Industry Association awarded Portola Hotel & Spa for their excellence in designing and upgrading a member lodging property in California, with completion within two years. For a second time, the Portola Hotel & Spa was recognized by the California Hotel & Lodging Association for the property's commitment to the environment through on-going green initiatives and sustainability efforts. Spa on the Plaza was recognized as the Best Spa by the Salinas Californian. Peter B’s Brewpub was recognized by Monterey County Herald readers as Best Pub, Best Brew House/Tap Room, and Best Gastro Pub, and Spa on the Plaza was voted Best Spa. Portola Hotel & Spa was named as a winner of the Smart Meetings Magazine Platinum Choice Award for three consecutive years. This prestigious award recognizes excellence in service and amenities among meeting hotels and resorts in the U.S., Canada, Mexico and the Caribbean. Peter B’s Brewpub at Portola Hotel & Spa was awarded a Silver Medal at the Great American Beer Festival 2016 for "Miss IPPA" in the American-Style Fruit Beer Category. To learn about more award-winning craft beer, click here. Portola Hotel & Spa is participating in the USGBC’s Recertification Beta Pilot Program, the first hotel to undergo this recertification process. Portola built upon the sustainability initiative that it established in the first certification in 2011, including having 20% of the hotel’s employees commute using alternative forms of transportation including biking, walking, carpooling, and public transit. Portola Hotel & Spa was awarded for Best of the West by Meeting Focus Magazine for three consecutive years since 2013. Portola Hotel & Spa offers meeting and event planners the opportunity to create sustainable and eco-friendly conferences and events. Their Green Event Features include zero waste meetings & events and composting of all post-consumer items among other things. Jacks Restaurant & Lounge, located within the Portola Hotel and Spa, has been awarded Wine Spectator’s 2015 Award of Excellence for its wine program. Their wine list was recognized not for diverse with variety of selections only, but is also designed to accommodate the most discriminating connoisseur’s palate while simultaneously providing a sensory awakening for the novice. Peter B’s Brewpub in Portola Hotel & Spa was awarded the coveted Silver Sow Award for Best Brewpub in Monterey & Santa Cruz Counties. This award was strictly voted on by listeners of KPIG Radio in the tri-county area.